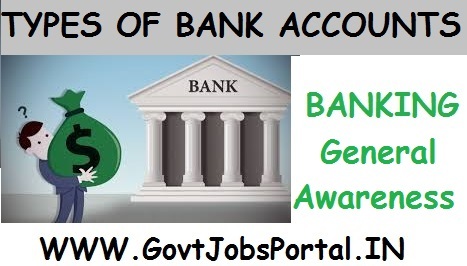 You know that BANKING AND GENERAL AWARENESS section is most important in bank exams in PO and Clerk and for other competitive exam. If you want good score in bank exam then you have to score good in general awareness section. The questions in this section given from current affairs and static GK form Indian banking System. So we are providing the static GK (banking GK) for bank exams. 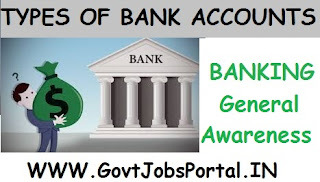 It will be very helpful in exam, you should study General Awareness from www.GovtJobsPortal.in, stay updated as well as prepare for General Awareness or banking section which is given in BANK EXAM SBI AND IBPS. Today’s topic is TYPES OF BANK ACCOUNTS IN INDIA. This is the one of the most important topic in general awareness section in bank exam. There are very frequent questions from this part asked in many exams earlier. Just have an overview and read it carefully, it will be helpful in exam. This type of bank account used to save current deposits. Big businessmen, companies and institutions such as schools, colleges, and hospitals have to make payment through their bank accounts. Since there are restrictions on number of withdrawals from savings bank account, that type of account is not suitable for them. They need to have an account from which withdrawal can be made any number of times. Banks open current account for them. On this deposit bank does not pay any interest on the balances. Rather the account holder pays certain amount each year as operational charge. For the convenience of the account holders banks also allow withdrawal of amounts in excess of the balance of deposit. This facility is known as overdraft facility. (a) The main objective of Current Account holders in opening these account is to enable them (mostly businessmen) to conduct their business transactions smoothly. This type of bank account in India used to save money for long period. Many a time people want to save money for long period. If money is deposited in savings bank account, banks allow a lower rate of interest. Therefore, money is deposited in a fixed deposit account to earn interest at a higher rate.